October 2015 – Concurrent Technologies announces VP F1x/msd, a 6U processor board extending the choice of long-life VMEbus products designed to be available beyond 2020 without significant end of life component issues. 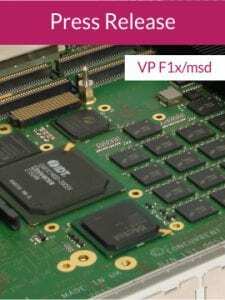 In particular, VP F1x/msd uses the same tried and tested VME64 bridge device as the two other new VME boards announced in 2015 by Concurrent Technologies. VP F1x/msd offers the ability to host two local PMC/XMC modules plus two additional PMC modules mounted on an expansion carrier. 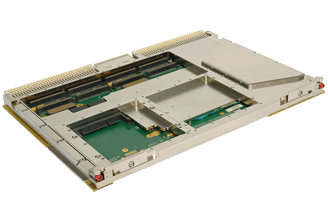 PMC modules are still widely used to provide simple I/O connectivity and VP F1x/msd enables customers in the military, aerospace and other similar markets with long life-cycle programs to more easily transition to a newer generation of processor. Two processor variants are offered: a low power consumption 2-core Intel® Core™ i5-4422E processor (3M cache, up to 2.9GHz) for simple technology transitions; a 4-core Intel® Core™ i7-4700EQ processor (6M cache, up to 3.4GHz) for higher performance applications. To enable upgrades, configurations are offered with backwards compatible rear I/O pinouts for VP 717/x8x and VP 91x/x1x boards, introduced in 2010 and 2012 respectively. In addition, Concurrent Technologies enhanced VME device drivers provide a consistent Application Programming Interface (API) to simplify the upgrade process. 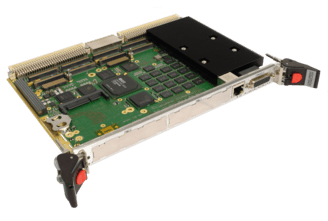 “Having announced three new VMEbus boards in 2015, we have demonstrated our commitment to support VME customers needing long-life cycle boards based on Intel processors. We continue to enhance our portfolio with dependable hardware products that can be deployed in a range of environmental conditions, complimented with software and firmware packages to enhance security, speed up boot times and simplify integration”. Air-cooled VP F1x/msd boards are available for customer shipment in Q4 2015 with rugged conduction-cooled variants in 2016.